When the listed building restrictions were originally introduced the compensation for not being to do exactly as you wished with your house was that the government would provide grants towards maintainence. Obviously successive governments have seen these funds as an easy target when seeking cost cuts and so despite the legitimate limits on changes still being enforced, the cost of the work was now largely borne by the owner. So the news that English Heritage are atleast providing matched funding to the tune of £210,000 for much needed repairs and conservation work to the beautiful Hagley Hall in Worcestershire is to be very much welcomed. Now, if only they could perhaps prise open the coffers of the lottery funds to provide further grants we might actually be able to claim that we truly support our built heritage. 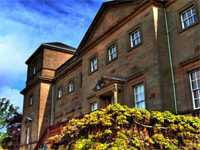 This entry was posted in Comment, News and tagged conservation, country house, english heritage, grade-i, grants, hagley hall, listed building, restoration, worcestershire. Bookmark the permalink.